wvictor: Left foot on the smear. Right toe dragging below for the first move. stevebinning: Pinch those feet! The hands felt much better starting low, getting the feet set, then pulling into it. gavinjohnson: left heel on big tooth on corner way up high. left hand to first sloper and top out normally. Paul Denzler: Believe in the toe hook. The only dry problem on the Animal Magnetism boulder today. Stoked! New beta with the right hand: I went to the sloper an finally figured out how to use the foot properly. Finally. One of the most unlikely climbs. Tricky to get started, but is well worth it. A really cool boulder problem that I finally managed to actually pull onto today..
First day could only do the first move, second time could only do the second move. Third session sent it all. Fun. Once you find the right foot placement it goes quickly. Toe hook beta was revolutionary. Short but involved. I had a pretty weird experience with this climb. Took a while just to pull upwards off the starting holds, but when I finally sent it it felt easy. Yay!!!! First V7 outside. What a perfect Thanksgiving afternoon. Absolutely loved this climb, thanks Aly for bringing me to your proj! A must climb! It is as good as the hype. Felt impossible until the send and then like a 7. Recipe for sending: 1) Wait out days of rain 2) Climb on on Mindbender as soon as its dry 2) Grab rock instead of endless layers of chalk. I feel like I've earned my Squamish merit badge. Big jump move went easy went I put the right foot on. So fun! Deceptively subtle yet powerful, and a true test of contact strength. surprised myself and almost flashed! then couldnt pull on for the next 4 tries but ended up sending! Super sweet! great way to end a mileage day. This boulder took me a very long time to climb. But it's finally done! Great climb! Thought it was a 6 in the book? Amazing twist jump move, psyched! Did my first day in squamish this year, thanks to motivation from Matt Barker! One of the few enjoyable problems where the crux was sustaining on the first holds. Hard V7. Love those two little slopers. wow, 2 amazing moves. it all has to click to make this one work. really burly and technical. First try of the day! topout was wet last attempt. short and a bit contrived tho. crazy jump heel hook beta...wont work for the low. rad. Fun. 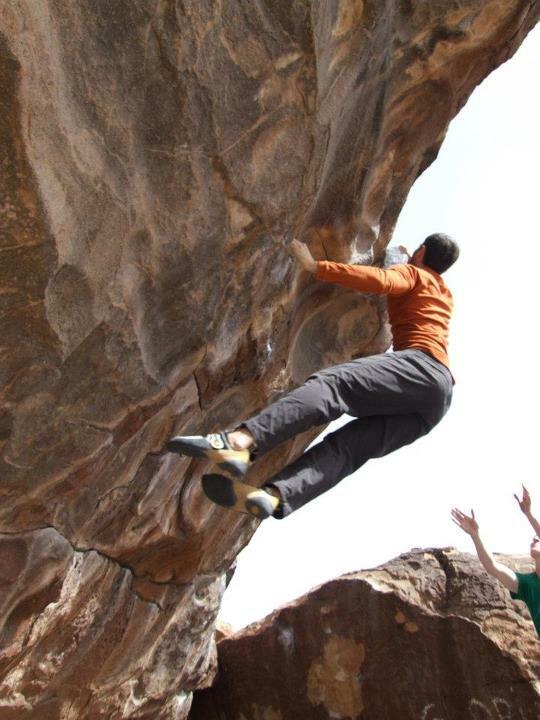 Graded V7 in the guide. Thank god for the brush that showed up at midnight. Don't think it would have gone without. Logging this for the top 100; I climbed it from the sit.